Early reviews about the IBPS PO Question paper 2012 suggests that the paper was a bit tough than the previous IBPS Paper.Some students are saying like that, "This is the toughest ever PO paper in the Bank exams History". A few are saying that " IBPS ne Barbaad kar Diya" i.e IBPS had ruined our career. In this article we will discuss the Pattern and the nature of Questions asked in the IBPS PO Question Paper of 17th June, 2012 (Morning Shift). 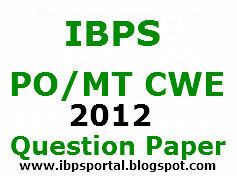 Those students who appeared in the IBPS Exam on 17th June, 2012 are requested to share the Questions and their views about the Question Paper. Here are some of the Questions that were asked in the General Awareness Section of the Morning Shift of IBPS PO Exam on 17th June, 2012. 1) Smart Money Refers to ? 2) Which among the following is not the Functions of RBI ? 3) Who is the Chief guest on the Bharat Prvaasi Divas ? 4) Banking Ombudsman is applicable to ? 5) In case a person is not satisfied with the Banking Ombudsman he can further make complaint to? 6) A question is asked on Draft Payee ? 7) Which Indian player had won the Australian Open 2012 ? 8) Who among the following is the author of Book titled " Nirbhsham" ? 9) Who among the following is the Women CEO of a Bank ? 10) India recently voted against Sri Lanka in the UN Assembly over which issue ? 11) A few days ago, two Italian ships were captured and Detained as they were involved in the ? 12) Which among the following documents in not required to open a Bank Account ? 13) NREPA that was recently inducted in the Indian Navy is a ? 14) Which mechanism is used to transferring money in between International Banks ? 15) Ranbir Rapport was awarded with Best Award in IIFA for which film ? 16) At which place Afro Asian athletics championship was held recently ? 20) Who is Australian Cricket captain of the India-Australia Test Series held in January 2012 ? 21) Mario Monti was recently presented which award ? 22) Panch Parmeshwar Yojna is recently launched by which state of India ? 23) Which among the following is not a Money Market Instrument ? 24) What is a Debit Card ? 25) Which among the following facilities is not provided by LinkedIn ?